A slushy, messy snowstorm began just as it was time to head out for Sunday afternoon errands. March was arriving like a very frosty lion. Still, we made all the stops we needed: groceries, pet supplies, and a new sink for the powder room were acquired without incident. In fact, our trusty Prius fared better than many all-wheel drive vehicles we saw sliding around. Home and safe, unloaded, we set to work. She stirred together a marinade of soy, Worcestershire, garlic, and spices in which a small London Broil was bathed. I chopped aromatics while she browned some sausage; then the vegetables sautéed in the drippings. She added beef stock, water, and a simple-and-tasty red wine, red lentils, shaved carrots, and probably a spice or four. The whole lot simmered, then chopped kale was added. Half an hour later, she asked how it looked. I fought off the urge to stop what I was doing and eat the entire pot. I’m not sure which spices or herbs she’d added to the soup, because I had moved onto my next project. Strawberries had been on sale, but in a larger container than we usually buy. 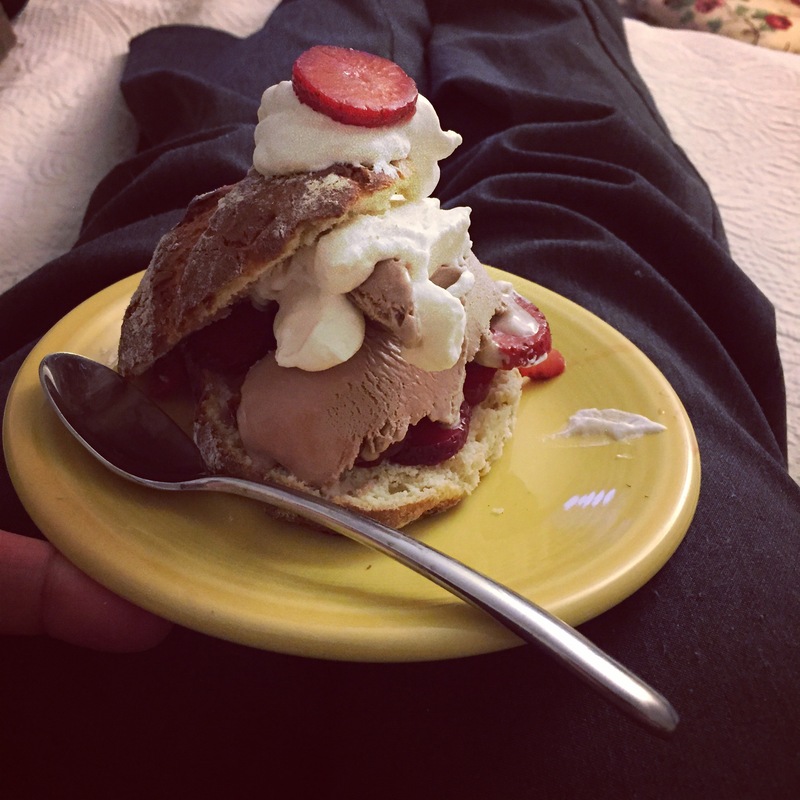 “Well, you could make shortcake for dessert,” she said. She may have been kidding, but I thought it was a good idea. Besides, there was a little cream left in the fridge, and there is a new immersion blender. Whipping the cream was a snap. I added a little powdered sugar and a drop of vanilla to the whole batch, served a bit of it sprinkled with cocoa powder as a treat for her, and stowed the rest in the fridge. I made a batch of biscuit dough, dividing it in half and adding a little sugar to one portion. I was improvising, here, because I had forgotten that the actual shortcake recipe is slightly different than the one for biscuits. I patted out each section of dough and used different sized cutters to differentiate the ones for shortcake from the unsweetened biscuits. I suppose it wouldn’t hurt to make a breakfast sandwich on a sweetened biscuit, but the first bite might be a little strange. Both sets came out well, though a little darker than I’d intended, due to an oven-timer-setting error. She scrubbed and roughly chopped some potatoes and set them to boil. When they were tender, she drained the pot, added butter and sour creme, and “smashed” them with a potato masher. “Should I do the lamb now?” she asked. Ground lamb, cooked in a tiny amount of oil and spiced heavily with cinnamon, cumin, coriander, black pepper, and paprika, will be topped with toasted pine nuts and accompany a batch of hummus made from the chick peas that spent hours in slow cooker. Scooped with bits of pita or crackers or really good toast, it’s one of our favorite Middle Eastern dishes. I said she should go ahead. The kitchen was so fragrant by this point that one more batch of something wouldn’t make me any more likely to swoon than I already was. Besides, I was pretty sure that once we cooked the steak, the day’s cooking events would be all over. Better to delay gratification a little and finish our homework. She cooked and drained the lamb, and set it aside to cool, but we decided to make the hummus another day. She went off to fold a load of laundry while I turned my attention to tonight’s dinner. I heated the cast-iron skillet, adjusted the temperature of the still-warm oven to 325F, and removed the steak from its marinade. It wasn’t a huge steak, but it was too long to fit in the skillet. She cut it in half using the chef’s knife she was still holding after washing; she washed the knife again–probably the sixth or seventh time it had been washed during the afternoon–then dried it and finally put it away. I seared the steak on both sides, then slid the skillet into the oven and set the timer for 15 minutes. And checked to be sure I had set it correctly. While she folded a load of laundry, I got the chef’s knife again to trim a bunch of asparagus–then washed and dried it and put it away again again. The asparagus was wrapped, burrito-style, in a moist paper towel, and microwaved for a minute. We reserved a quarter-cup of the marinade when putting the steak in the rest of it; this reserved portion went into a skillet to reduce and be fortified with a bit of butter. While the sauce-to-be did its thing, I washed, hulled, and sliced some strawberries–using a paring knife for a change–and sprinkled them with a little sugar and a few drops of balsamic vinegar. Halving the steak had a side benefit: I could cook the halves to different temperatures. The rare side came out and was tented with foil to rest while the rest stayed in the oven for another few minutes. When the second half came out and began its rest, I stirred the pan juices from the steak into the sauce, wiped the skillet and used it to slightly brown the par-cooked asparagus. It was, at long last, dinner time, and the first time either of us sat down in many hours. 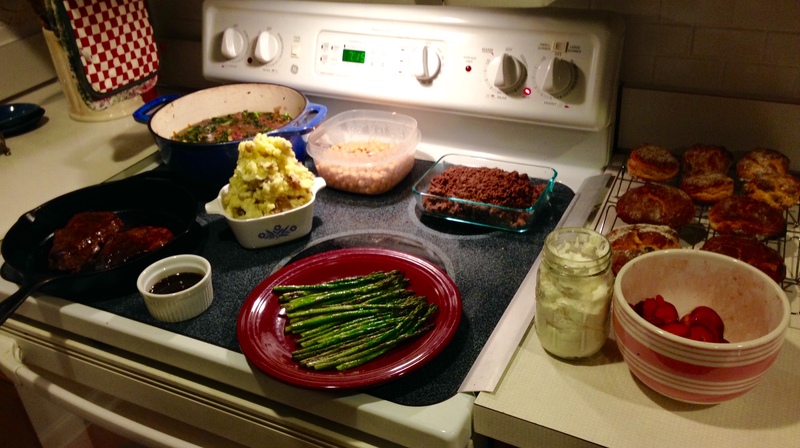 We had juicy, spicy sliced steak, a mound of smashed potatoes, a lineup of intensely green asparagus spears. And the makings for lunches and quick dinners for days to come. We enjoyed a little Sunday evening television, pausing during what would have been a commercial break save that we watched streaming video rather than broadcast TV for dessert assembly and kitchen tidying. Late nights of work and rehearsal, takeout food, and exhaustion had left us a little dietarily grumpy last week. We had resolved that this week would be better, and Sunday was the foundation on which that resolution would stand. We didn’t end up listening to the audiobook she’d suggested. I’m sure there are plenty of things we didn’t get done, but we also didn’t cook so much food that anything is likely to go to waste. Even if we weren’t completely ready to face every challenge the week might present, we were well-fed, and we had spent the day in each other’s company. The snow might have stopped falling by this point. We didn’t look. All the things: (Back row) Sausage and kale soup, chickpeas, spiced lamb, shortbread and biscuits. (Front) London Broil (rare and well-done), steak sauce, smashed potatoes, pan-grilled asparagus, whipped cream, macerated strawberries. Every night does not warrant a fancy dessert.